I am a huge fan of P!nk and I am happy that I sprung for the tickets to see her in Cleveland. 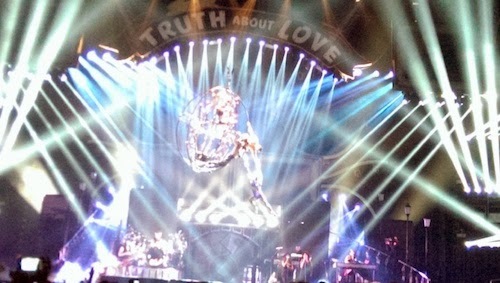 P!nk is one of those rare entertainers...she can sing, she can dance and she may have missed her calling for Cirque. Her acrobatic skills are nothing short of amazing. The concert started off with a pervy version of Beetlejuice promising to explore all facets of love - including the naughty bits. I could have done without him making guys in the audience uncomfortable by rubbing himself against their head. It was awkward as it sounds. There were parts of the show that gave me a flash back to 8th grade when I convinced my mom to take me to see Madonna. That was during "Like A Virgin" and Madonna was at her rebellious sexual peak. P!nk didn't need to imitate that...girl has her own skills. Not only was her voice amazing and pitch on, but P!nk really seemed to enjoy herself. She was happy to be in Cleveland and thanked the audience for the snow for her daughter to see. She was grateful for the gifts from the crowd, including what looked like a piñata of her head. The most amazing part was during "So What" where she flew, and I mean flew through the crowd. I hope my video below does it justice, because I almost threw up trying to follow her through the air. I do have some advice for folks attending concerts in general. I know you don't want to hear this, but I am going to strongly encourage you to wear comfortable shoes. I saw more middle aged women hobbling around like baby deer in their "going out" heels. Quite a few folks flat out gave up and walked out into the snow with their shoes in their hands...if they remembered to take them. 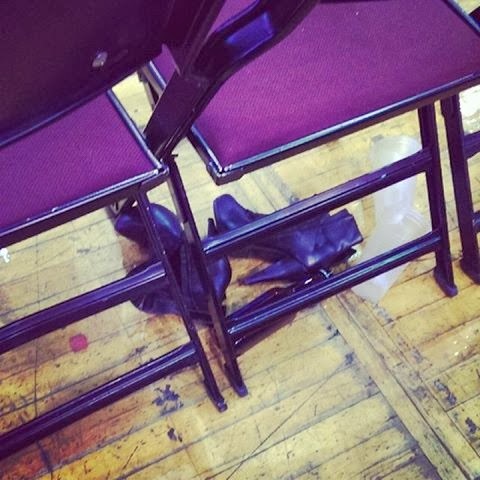 Some poor soul lost her shoes after the concert.